The trip to Philadelphia back in May of this year was mostly work, but we did get to dine around and taste some of the fine cuisine in the city where Freedom Rings. One such place was the hotel’s standard restaurant, 13 Restaurant, which was a good place to sit, relax, enjoy a cocktail, and wind down from a day of conferencing. On our first night in town after a day consisting of travel and then walking about town for most of the afternoon, back at the room we decided to just make it to the lobby and wander into the restaurant, which was fine for us, we were beat. 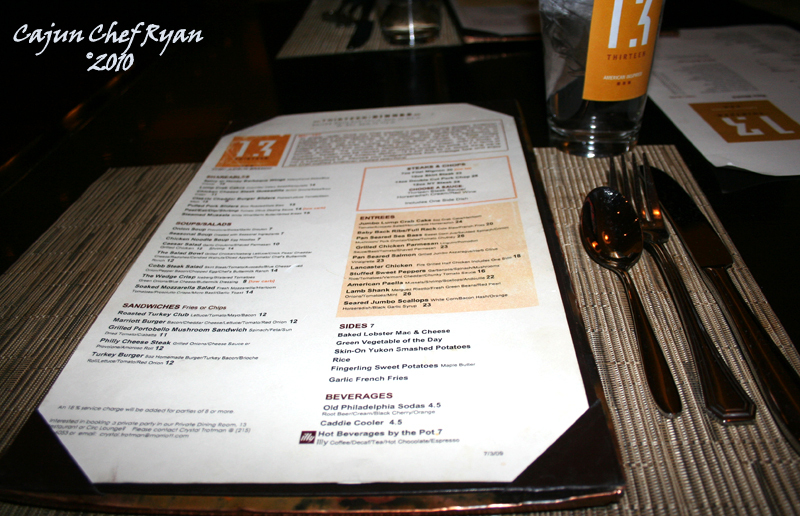 The restaurant boasts an eclectic menu of seafood, meats, and some vegetarian offerings as well. I selected the sweet peppers vegetarian item, and Monique ordered the crab cakes. Both were great, in fact, the crab cakes were mostly crabmeat, which is far and few between most restaurant fare these days. Therefore, on to the stuffed sweet peppers, this dish is worthy of a remake, especially since at this time, we had just wrapped up our 6th week on the ETL diet. Moreover, vegetarian entrees at traditional restaurants are always a welcome treat! The real challenge is the ability to take an item from a restaurant menu without a recipe, deconstruct the ingredients, proportions, preparations, flavors, and methods, and then recreate it from the bottom up. This is exactly what I did with this recipe. Knowing the foundations of how a bell pepper gets stuffed, constructing a balance of the stuffing ingredients, and improving on the flavor are the keys to this dish. Look at the photo at the top, the one of the lone stuffed pepper, that is representative of this recipe. Do you notice anything different between that one and the second image of the sweet peppers that the restaurant served? Notice how our pepper is standing up with a firm yet al dente flesh, no sauce, and is garnished with micro greens. Now, look at the restaurant stuffed peppers, they are limp, laying on their sides, and charred on the top, and with the tomato garlic sauce on the bottom of the plate. The main differences in how we prepared our stuffed peppers and how the restaurant did theirs is that we did not par-boil our peppers, we did not char-broil the tops to brown the cheese, and there is no sauce with our version. What follows is our take on the recipe based on the menu description and more from the look and taste of them, I ate this dish on both visits to the restaurant. Our version is so moist that there was no need for the chunky tomato sauce with garlic, however, it would not take away any of the flavor from the sweet pepper should you decide to incorporate one into the recipe. 1. Slice each pepper in half at the equator; remove any seeds and ribs from the inside. Place the eight halves with the open side up in a 9×9 pan. Pre heat oven to 450° F.
2. Using an oil mister, spray enough olive oil to coat the bottom of a sauté pan. Add the onions, shallots, and sauté until soft and translucent over medium high heat, then add the garlic and continue to sauté, stirring often. Add the mushrooms and lemon juice and continue to sauté until mushrooms are soft. Add the tomatoes, stir well, and then cover to stew down for about ten minutes. 3. Remove the cover and allow the moisture to reduce to almost dry, and then add the rice and garbanzo beans stirring well. Mash several of the garbanzo beans to help thicken up the stuffing. Add the vegetable stock and stir well. Season the filling with salt and white pepper. 4. Toss in the spinach and stir well, then turn off the heat. The spinach will wilt gently into the filling, and stir well to spread out the ingredients among the filling. 5. Spoon the filling evenly between the eight open peppers. 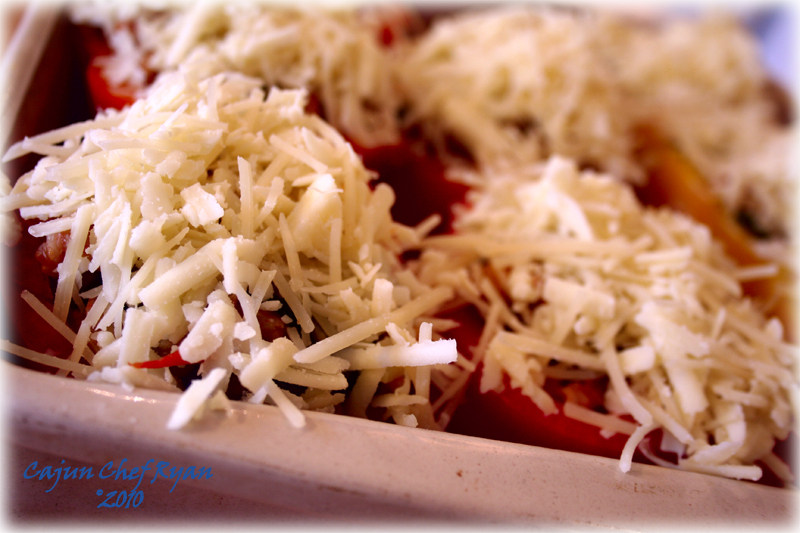 Combine the two shredded cheeses and evenly sprinkle over the tops of the filled peppers. 6. Pour in the ½-cup of water, or about ¼ inch of water into the pan, making sure you do not get any water in the peppers. 7. Cover the pan with heavy-duty foil and place in the pre-heated oven for 35 minutes. 8. Remove the foil and continue to bake in the oven for 10 more minutes or until the cheese is melted and slightly browned. 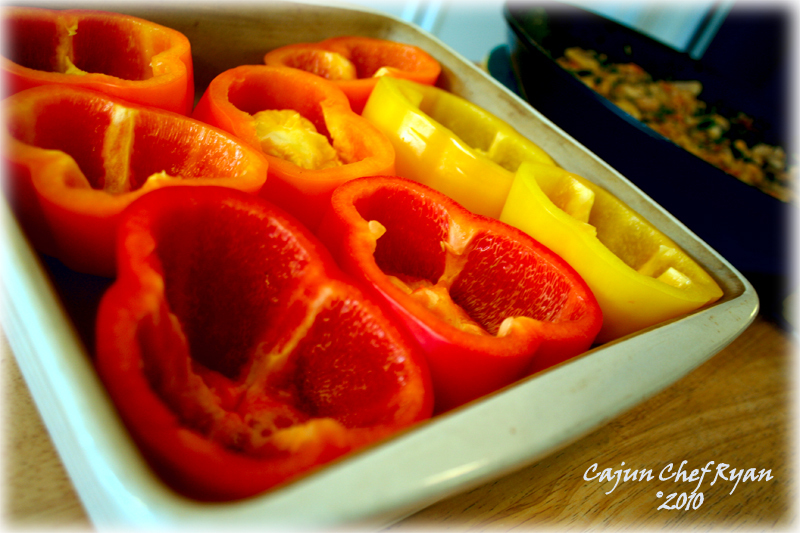 Once out of the oven allow the peppers to cool for about 10 minutes, then serve them on individual plates. This recipe will serve eight. This really looks good. I can just imagine the taste of the parmesan together with the distinctive taste of the peppers. I am very far from Philadelphia but at least now I know how to make these at home. Thanks. These look perfect! Creamy, flavorful and healthy! 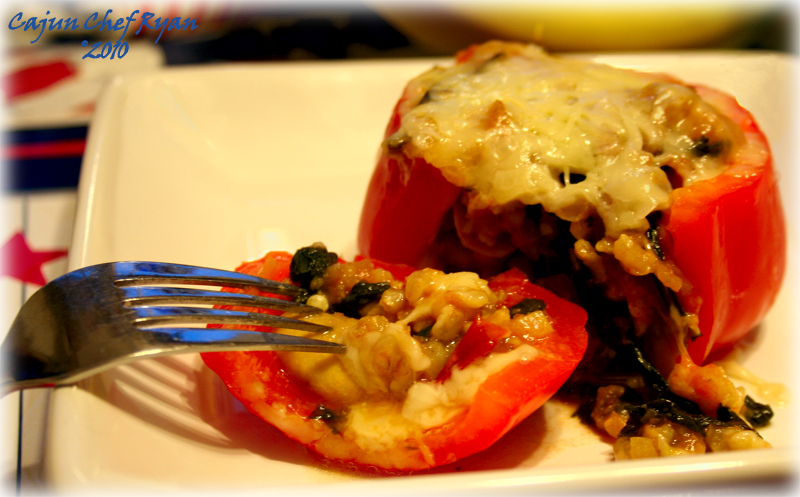 I love stuffed peppers and that looks like some pure cheesy goodness! how very lovely. I must say I do like your version better. I am not a big fan of limp peppers even though they are smooth and get a creamy texture. For stuffed peppers, I prefer them to at least retain their shape. This recipe is amazing. Holy delicious. My roommate in college used to make stuffed peppers and I always loved it when she did.. these look great! I’m definitely adding it to my recipe collection! What a fabulous way to stuff peppers. It looks like you did a spot on job of remaking the meal you had in Philly. My peppers are just coming and these are perfect. Parboil the peppers? Heavens to Betsy – never occurred to me! Peppers never looked so enticing. 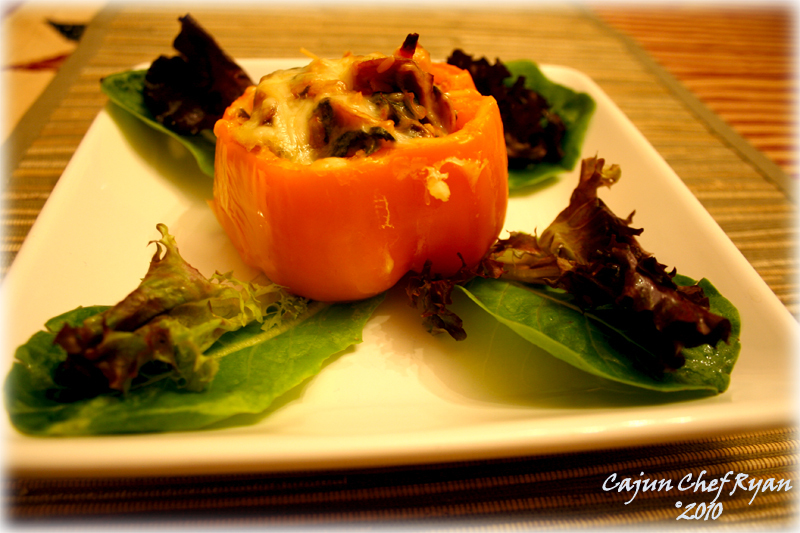 Love stuffed bell peppers, great recipe, they look fresh and deliciously savory, yum! How true about deconstructing a dish from a restuarant and you do it so well! 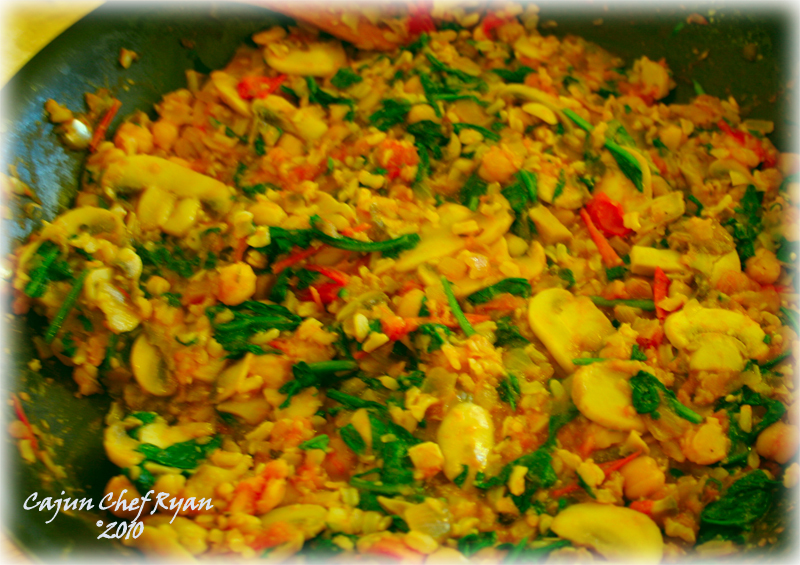 Beautiful and colorful dish Chef…lots of healthy ingredients. Thanks for the post! Love that stuffing – these are gorgeous and your photography is simply perfection!! Great looking stuffed peppers, love the different colors and the stuffing. Sound very delicious. They look fantastic, great dish. Also, crab cakes with mostly crab? Well I never! 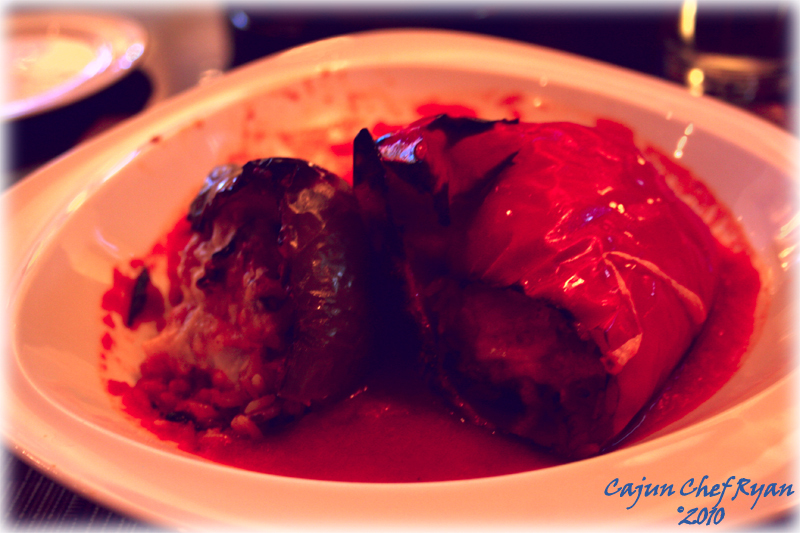 Oh lovely stuffed sweet peppers. its a nice change from my mom’s nightmarish ground beef and rice with canned tomato sauce from childhood lol. Keeping the peppers al dente is definitely the route to better flavor and texture. I choose your version. 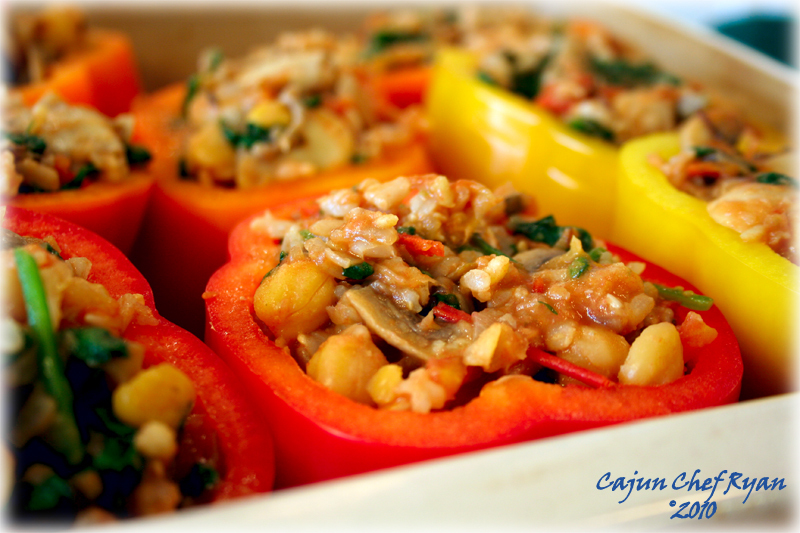 Evelyne, you are so right, the old style stuffed peppers had their place years ago…in the past! Carol, so glad you agree! Conor, indeed, crab is king! wow, those look amazing! stuffed peppers are one of my favorite things to eat, and the ingredients you used for these look so delicious! i wish i had these for lunch today! Beautiful dish. That photo with the peppers from right out of the oven with all the melty cheese on top makes me soo hungry. Love how you took something good and made it even better! 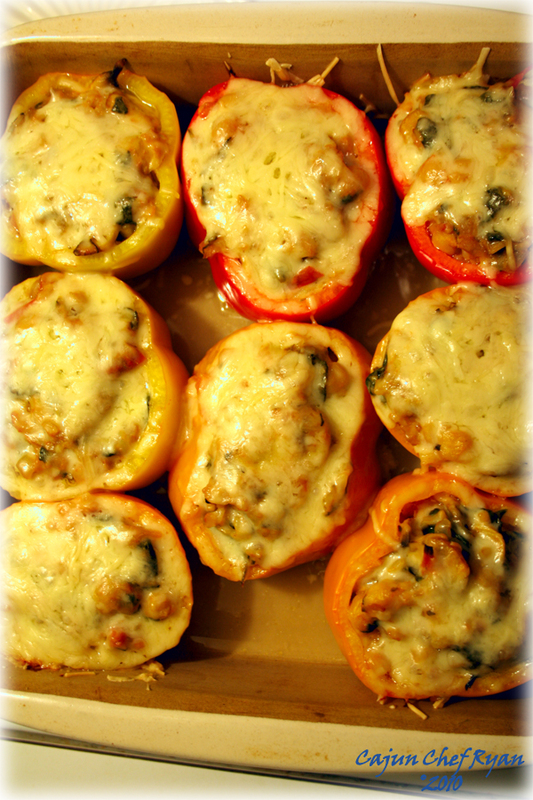 Your stuffed peppers are picture perfect! The filling looks very delicious! Oh yum, those sound SOO good right now! Oh, I can almost smell them! Fantastic! I always love everything stuffed, either the European or Asian style. When my husband (aka Pepperphobic) is out of town, as he is now, I eat peppers virtually every night. I love the healthier approach you’ve used here to stuff my favorite vegetable and have bookmarked this beauty. The combination of ingredients and flavors sounds wonderful! Love that these are stuffed with chickpeas instead of meat. They look delicious!! What a lovely blog you have. And I’d be happy to share this food with you! You were chosen, randomly, as one of the winners of the giveaway on my blog. Can you contact me at mailglutenfreegirl.com? thanks! The stuffed peppers look fantastic! Really like your choice of fillings!